A police crash report says his truck “traveled to the right, traversing the shoulder and drove into the grass” before it rolled over. Windler was thrown from the vehicle which landed on top of him. A United Airlines plane has skidded off a runway at Chicago’s O’Hare International Airport amid snowy and icy weather. 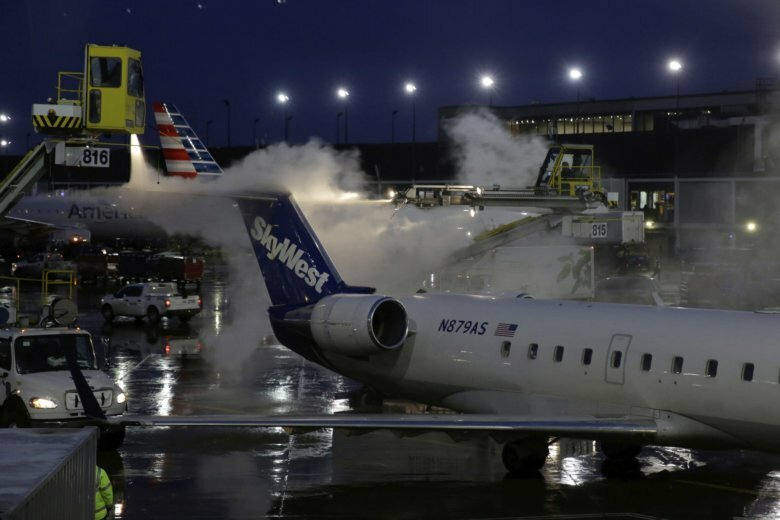 The storm prompted the cancellation of nearly 1,000 flights at Chicago’s airports on Saturday. The average delay at O’Hare International Airport was nearly an hour on Saturday afternoon. Some Midwesterners aren’t letting a winter snowstorm keep them indoors. Tremmel said running in snow is “like running in sand, so you have to go a lot slower,” but “what’s worse is 40 degrees, wind and hail. New England residents are bracing for up to 18 inches (46 centimeters) of snow in northern regions from a storm that’s coated much of the Midwest in ice and snow. The National Weather Service says southern areas of New England could see several inches of snow and up to a half-inch (1.25 centimeters) of ice. That’s stoking worries about power outages.